For early American households, the herb garden was an all-purpose medicine chest. 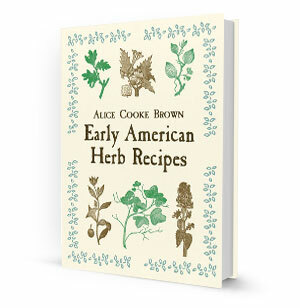 This book has a wealth of information on the uses of herbs by homemakers of the past through more than 500 authentic recipes as they appeared in their original sources. The recipes cover the use of herbs for medicinal, culinary, cosmetic, and other purposes, from making vegetable and meat dishes to dyes and insecticides. More than 100 fine 19th-century engravings of herbs add to the charm of this enchanting volume-an invaluable reference and guide for plant lovers and herb enthusiasts that will delight and astound the 21st-century reader.